We will begin by creating a data grid table and configuring it. Add a data grid to a card by dragging from the Tools palette onto your stack. 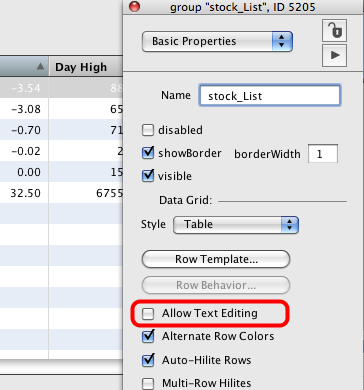 Since this table will only display data turn off Allow Text Editing in the Basic Properties pane of the property inspector. Resize the data grid to the size you want it to be and then open the property inspector. 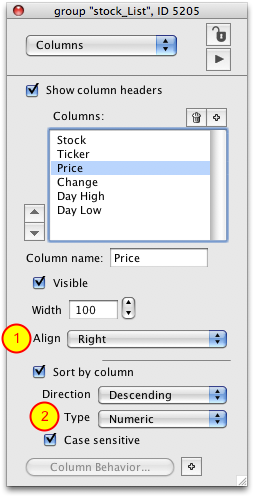 Switch to the Columns pane (1) and use the + button (2) to add columns. You can then set the name (3) and width (4). 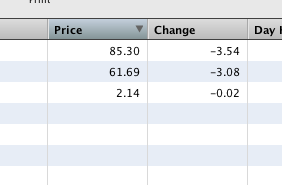 If you set the uText or uData property at this point you will see something like this. Now you can change the alignment and sort type of the columns. For all numeric columns set the alignment to Right (1) and the sort type to Numeric (2). If you refresh the data in the data grid table you will see the new alignment and if you sort then the column will be sorted numerically.